The University’s main campus is located within the Greater Kingston Metropolitan Region at 237 Old Hope Road, Kingston 6, in the parish of St. Andrew and occupies approximately 18.2 hectares. It lies to the east of the Hope Botanical Gardens within the Papine/ Liguanea commercial centres. 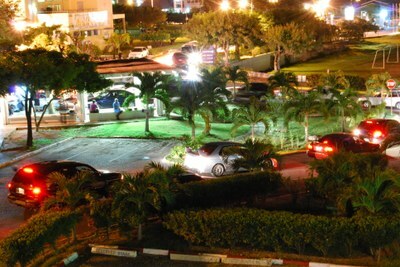 The campus is served by several bus routes and is within walking distance from the Mona Campus of the regional University of the West Indies and the University Hospital. The School of Public Health and Health Technology is located at 21 Slipe Pen Road, Kingston 5, which is in close proximity to the Kingston Public Hospital. The B.Sc. degrees in Environmental Health and Public Health Nursing, Occupational Health and Safety, Masters of Public Health and Post Diploma in Meats and Other Foods are offered at this facility. The College of Oral Health Sciences in the Joint Colleges of Medicine, Oral Health and Veterinary Sciences is located at 5 Arthur Wint Drive, Kingston 5, immediately adjoining the Bustamante Hospital for Children. In addition to regular classrooms, the campus houses a modern clinical facility that serves as training ground for the students. The Western Campus is located across the north western region of Jamaica in the parish of St. James. The teaching units are located in the city of Montego Bay, St. James. The Caribbean School of Nursing (CSON) is located at Barnett Clinic, 2 Cottage Close in Montego Bay. The Dome Street building at 17 Dome Street is the home for programmes of studies from the Faculty of Law (LLB), College of Business and Management (BBA), Faculty of Sports and Science has a BSc in Mathematics and Education and also provides the general education modules in mathematics. The Faculty of Education and Liberal Studies currently provides service for the humanities and will soon offer the BCAT programme in the West. The Students’ Union Western Office is located at the Dome St. building. UTech delivers the ASc degree in Business Administration from the Dome Street Campus under the supervision of the UTech, Ja. Academy. The University has collaborative agreements with five local community colleges, namely, Brown’s Town, Excelsior, Knox, Montego Bay and Portmore as well as the College of the Bahamas and St. Vincent & the Grenadines Community College. Under this arrangement, the first and/or second years of diploma and/or undergraduate degree courses in the College of Business & Management and the Faculty of Engineering & Computing may be pursued at these institutions. The first two years of the Bachelor of Pharmacy are offered at the College of the Bahamas. The Caribbean School of Nursing facilitates the delivery of the Post RN Bachelor of Science in Nursing in the St. Vincent & the Grenadines.